Want a lightweight travel trailer but have a large family? The Grand Design Imagine travel trailer is the perfect solution. There are plenty of places to sleep including pull out couches, a bunkhouse, and master bedroom, everyone will have a comfy place to sleep. And with 10 people, storage is always a concern. Besides the great amounts of interior storage compartments, outside in front you will find 47 cu. ft. of storage in the drop-frame pass-through compartment. Are you ready to explore this fully loaded home on wheels? The Grand Design Imagine travel trailer. Before you even enter the Imagine travel trailer notice the convenient outdoor kitchen with two burner range top, and refrigerator so you can cook and dine easily outside. 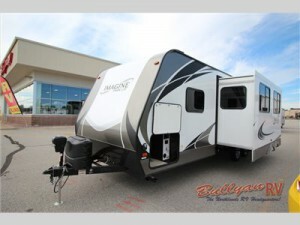 As you enter the Imagine travel trailer, you will notice how spacious the extending slide makes the interior. The slide includes an optional tri-fold sofa or theater seating for two, as well as a u-shaped dinette with removable ottoman. There is a beautiful kitchen right inside the Grand Design Imagine travel trailer. You will find a three burner range with overhead microwave oven, and a corner counter-top with large single bowl sink. An overhead skylight in the kitchen area provides a lot of natural lighting. And if you can’t bear to leave Fido at home, there are even pet dishes that get tucked away when not in use. Check out all the bells and whistles. 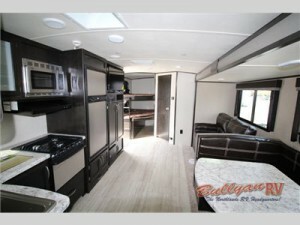 The master bedroom is in the front of the Imagine travel trailer. There is a comfy queen size bed to relax and get a goods night sleep after a long day of family adventures. With a wardrobe on either side of the bed and overhead storage, you won’t have to leave anything behind on your trips. When it’s time to take your next family vacation, consider making memories in the Grand Design Imagine travel trailer. Contact us today to get started!